I have finally graduated. Oh yes, it had been sometimes since the days I left my universities, hanging around, looking for job, shift to new place and getting into this new job, but somehow, only after the convocation, I felt that I have finally officially leave my student-hood behind me. Now armed with a scroll, I am ready to take on the world! Reminiscing, it seems like only yesterday that I had step out the comfort of Taiping into this middle of the peninsular. I can still remember vividly the time Y and I ventured into the bustling area of Wangsa Maju. We were so excited that on the first night itself we just walk out and wander around the area. We do not even know where we are heading or what we are searching for. Instead, food found us. We are in midst of all sorts of food, cheap yet good eats. We are introduced to so much new hawker food fare that can never be found in our home sweet hometown, among those are like kampar fishball noodles, pork ball noodles, curry mee KL style, chee cheong fun KL style, nasi lemak ayam from the numerous mamak stalls, claypot lou shi fun, my favourite banana leaf and yu tau mai (fish head noodle). People say that good food cannot be found in Klang Valley, but I digress, as good food might not have originated from here, but it seems to have found its way here from all over Malaysia. Food connoisseurs set up stall claiming from somewhere famous like Penang Char Kuey Teow, Kampar Fishball Noodles and so forth, making this place a food haven, where you can get the best of everything under one roof, technically. In my opinion, if you know where to look, you are sure to find good eats around Klang Valley. 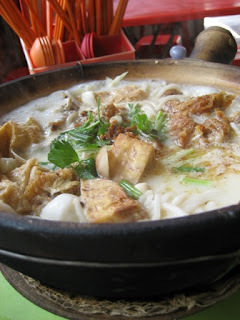 Nowadays, with foodblogging fever catching on in Malaysia, I have been reading numerous Malaysian blogs that features a whole bunch of good eats around Klang Valley, which had been extremely informational and also not to mention dangerous as it makes me want to go out and satisfy my desires right away. Typical of this tham jiak girl to start ranting about food while reminiscing of her days long gone. Let me get back to my graduation, ah yes, the convocation. It was certainly a once in a lifetime event, that my parents came, along with my Pho Pho accompanied by my aunt. How sweet of them. Although I had not been as excited about it the day before as I should, but during the time in the event itself, I was overwhelmed by a multitude of feelings. During the time we were waiting to go in the hall, I saw parents rushing around; once I saw a couple calling their child on the handphone, looking lost, I felt touched that how parents would come our of their own comfort cocoon to this unknown world just to see their child up there taking a piece of paper. This is how huge parents love is. Later, during the moment standing in the front row waiting for the time to go up, I felt honoured and proud that I have finally made it through the way I would I want it to be. I hope my parents are proud too. J’s convocation was in the afternoon session and so he did not get to attend mine, but in the wee hours of the morning he had took me there, how sweet, and then he came again later in the afternoon to pick me up. I had let my parents leave early as the place was packed and I wanted to take more pictures with my uni-mates. Well, during the time he picks me and before his own convocation starts, we squeeze in a bit of time to go out to lunch. Oh yes, time to talk about food once again. J took me to end my desires about this superb yu tau mai (fish head noodles) that he had been raving about; it’s nearby his office, which I would preen with jealously every time he described it to me. KL has loads of good food but I, living near the PJ suburb seldom have the luxury to try it, therefore this is one of those golden times I get to, just the right time to celebrate my graduation, with food of course. 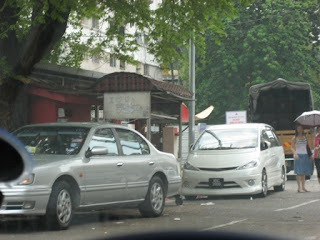 The place that J took me to is a little stall, off Jalan Raja Laut, that seems like it had been there since eons ago. When you got into it, you can see that it is filled with localites, looking like regulars who certainly had been coming back again and again. 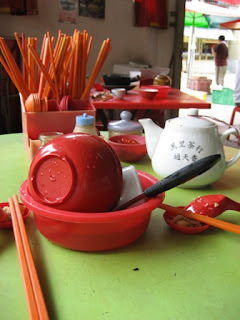 We took a sit near the side and ordered like how everyone would, yu tau mai and yit cha (brewed Chinese tea) for two. The yu tau mai comes in a huge claypot, the soup still boiling hot.